Beekeeping started as a New Year’s resolution for Lynetta Miller. “I decided that every year I was going to learn something new,” explains Miller. When she rang in the New Year in 2010, she decided to try beekeeping. “Nobody I knew kept bees. It was just something that sounded kind of cool, ” says Miller. What started as an experiment turned into a profession. Miller is now vice president of Burgh Bees, an organization that introduces the public to bees, beekeeping and acting as stewards of the environment. Miller is also an urban beekeeper who keeps her hive at the Burgh Bees community apiary in Homewood. Urban beekeeping may sound like an oxymoron, but for several hundred homes in the Pittsburgh area, it’s a reality. 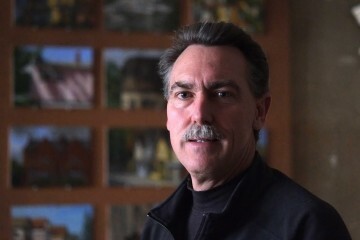 Steve Repasky photo by Brian Cohen. The urban beekeeping movement is steadily growing in Pittsburgh but has slowed due to permitting. That could soon change. With a city ordinance allowing more lenient permitting likely to pass at the end of the month, it looks like the buzz will only get louder. A city ordinance was passed in 2010 making it more difficult for Pittsburghers to have urban agriculture on their properties. As it stands now, the process is restrictive, including expensive application costs, public hearings and posting large orange zone hearing signs, similar to a restaurant applying for a liquor license. The sign often attracts the wrong attention, and leads to neighbors complaining to the city, resulting in a denial of the permit for the aspiring beekeeper without a refund of the application fees. 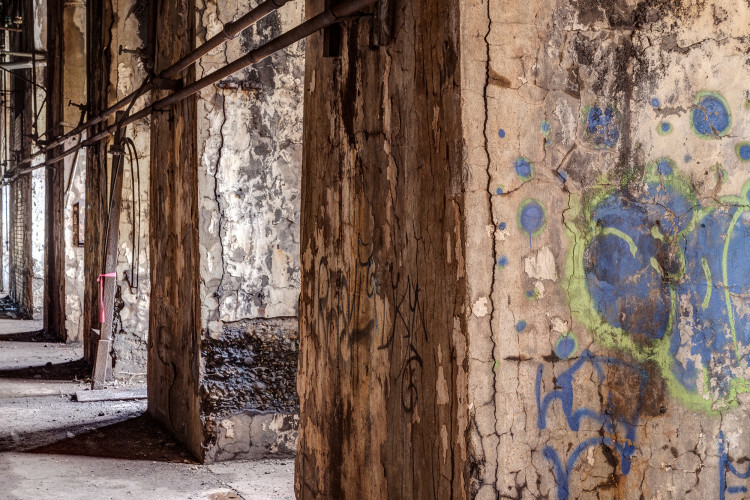 “This sent the whole thing [urban agriculture] underground. There were a lot of people keeping chickens and bees that were not permitted,” says Repasky. 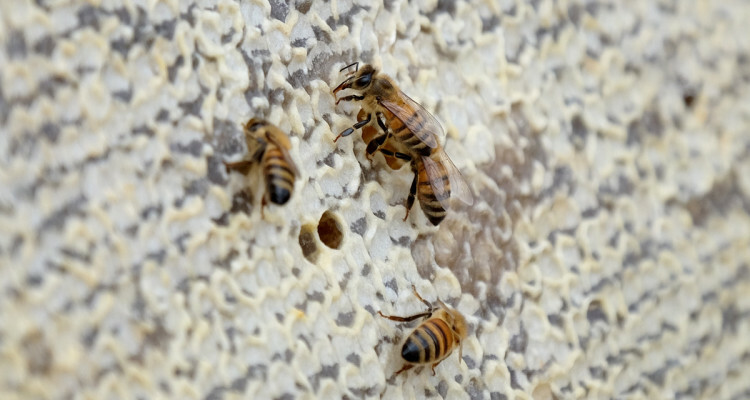 With a new ordinance in the works, beekeepers will be able to apply for a permit that costs only $70 instead of the current $250, and the zoning hearing will be bypassed if the applicants’ properties meet guideline standards. Repasky believes the simpler process will encourage more beekeepers to register hives with the city. That’s where Burgh Bees comes in. The nonprofit aims to educate the public and beekeepers about how to encourage sustainable agriculture in Pittsburgh and the suburbs. Community members have a chance to interact with the hives at the Community Apiary during beginner “Bee Curious” sessions and monthly Open Apiary tours. 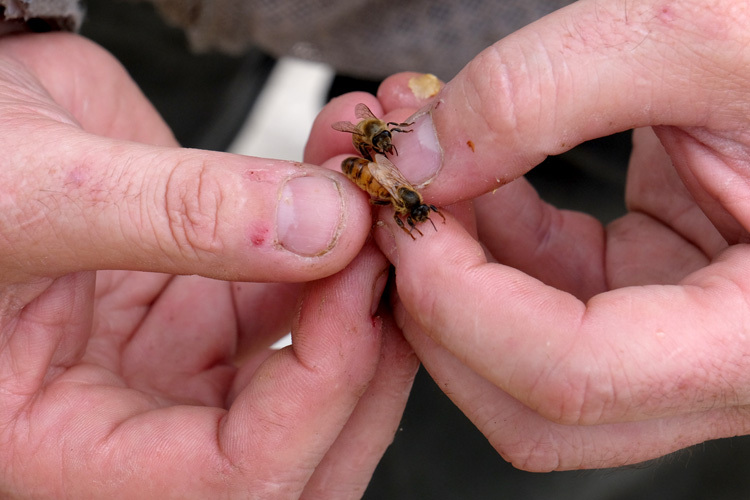 During the tours, visitors don veils and gloves to get a firsthand look at the bee colonies at work. Bread and honey at The Porch. Photo by Brian Cohen. Since it’s so readily available, Hermann has had the opportunity to experiment with fresh honey on the menu. 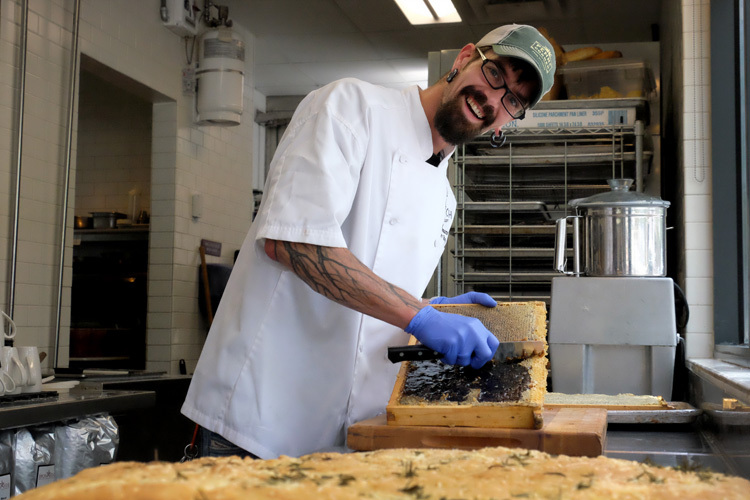 “It’s like jet fuel for my brain in the culinary world.” Diners can expect honey infused bread and pizza dough, truffle honey and cheese plates adorned with fresh honeycomb. 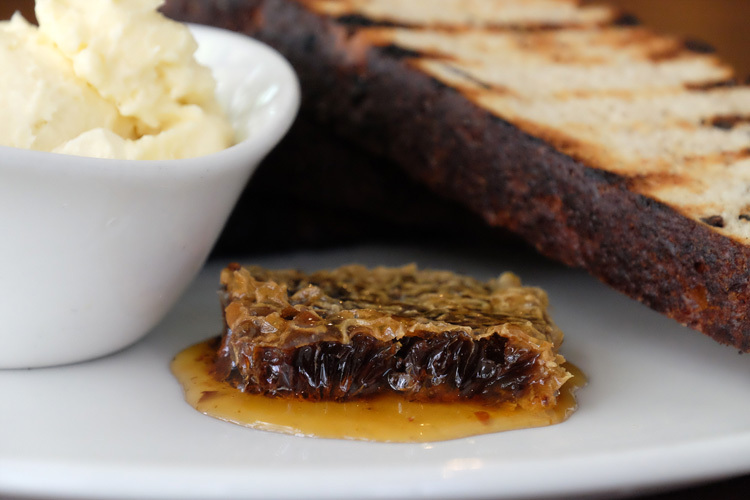 “It’s been a good experience teaching my culinary and my front of house team about what raw honey is, and what you can do with the honeycomb.” When Hermann harvests the combs, he brings them down to The Porch’s dining room to host live tastings. Kevin Hermann at The Porch. Photo by Brian Cohen. 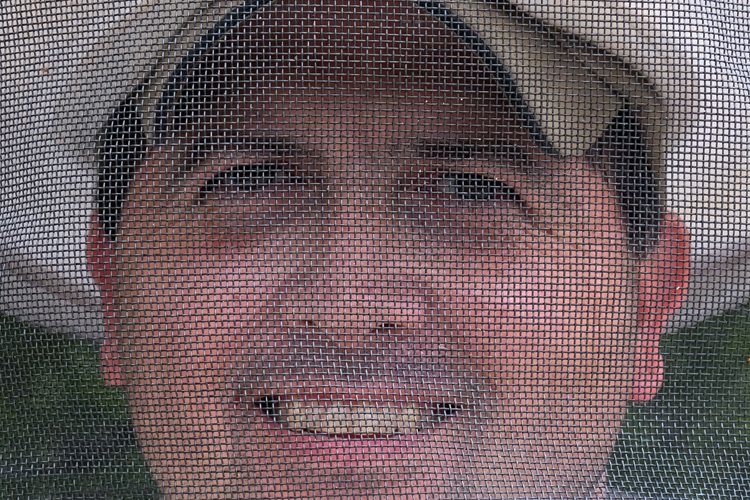 “[Beekeeping is] closer to a fish tank. All you get to do is watch them and feed them. You have to enjoy the biology of it,” explains Jana Thompson, an eight-year veteran beekeeper on the Northside. The bees operate as a super organism, or a single unit, making them an interesting subject to observe. Thompson started keeping bees after reading about them and studying them for over a year. While the harvest is rewarding, the process of keeping the bees is just as valuable to her. While it might not be for everybody, anyone can contribute to making urban beekeeping a success. “It’s all voting with your food dollars,” explains Thompson. “Support local, organic growers. All of that is supporting urban beekeeping.” You can find urban honey at farmers’ markets or local grocery stores. You can also get involved by attending Burgh Bees’ Open Apiary on Saturday, June 27.